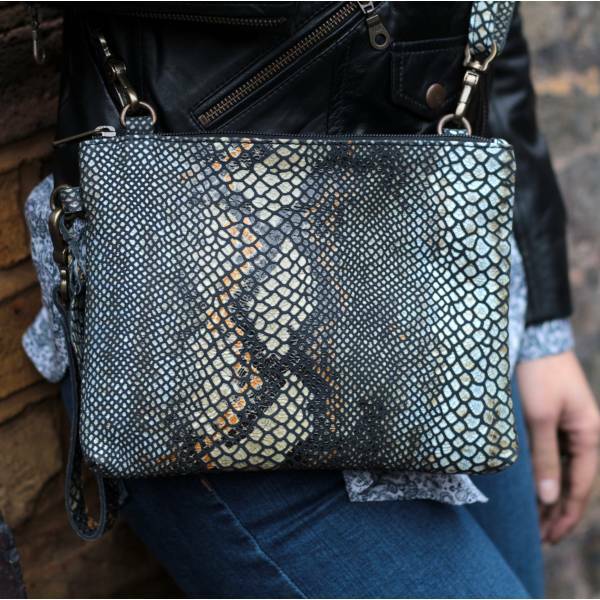 Our black snake-effect leather sleeve convertible clutch bag is perfect for any outing, day or night! This little gem can be worn as a cross-body, shoulder or clutch bag. The lining is black waterproof nylon, so no need to worry about make-up spills damaging the leather. The measurements for the bag are 18 x 24cm, the clutch strap is 15 cm long and 30cm in circumference. The strap for cross body and shoulder use is 70cm at its shortest and 132cm at its longest. The bag itself features an inner pocket with the dimensions 16 x 13cm. This little clutch bag is perfect for days or evenings out!